When one of my favorite beauty bloggers Irene Sarah got microblading I felt like that was my sign to just go for it. Microblading has been on my radar for almost 2 years, and I have been coloring in my brows since 1999 – seriously! After watching hours of YouTube videos, I looked up some reviews and came across Havy Tran of Chicago Microblading located in Schaumburg, IL. Truthfully, my goal was simple, just make my daily make up routine a little easier by having my eyebrows ready to go every day. Havy has the best and most patient personality especially for someone like me that came in with images of Irene, Huda, and of course Priyanka. She knew the look I was going for, bigger, thicker, fuller brows – period. We talked through some options and looked at dozens of photos and agreed on a combination strategy that would involve drawing in hair lines as well as shading. We carefully mapped out the lines on my face and then got to work. Microblading involves injecting pigment into the top seven layers of skin and therefore does not go deep enough to cause bleeding or even scarring (unless you have sensitive skin). It should last about 18 months and save you hours of time and product! The first ten minutes on a scale from one to ten were a seven on my pain scale. After that Havy numbed me up and finished up in about 25 minutes. The immediate results are dramatic, but after about a week the excess ink and slight scabbing went away to show the real result. In my case the result was a very natural and closely mimicked my daily drawing in of brows. My brows 10 days after microblading, no more filling in! All in all the procedure costs $650 and includes a touch up 3-4 weeks after your initial visit. I would not recommend ‘shading’ only the drawing in of hairs. As you can see in my photos, the shading has a tattoo like effect that seems unnatural. Another thing I noticed, is that I got is that the ink Havy used may have been one shade darker than something that is natural looking on me. I hope you found this review helpful or interesting. 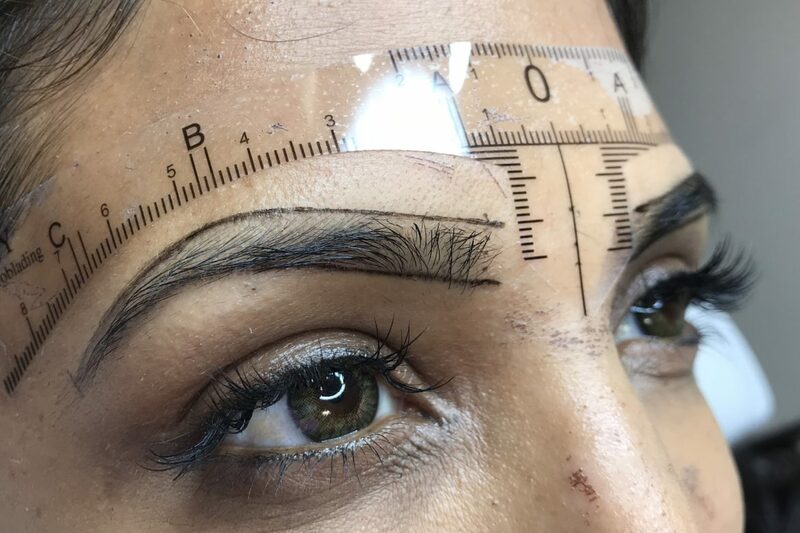 Would you get your eyebrows microbladed? Hi! Your eyebrows look AMAZING!! I have been filling mine in as well and have thought about microblading them. Is it basically tattooing small lines that mimic your natural hair? Hi Anandi, thanks for checking out the post. Yes, at its core it is just creating hair lines, but I also got shading which I would not recommend, it looking too ‘colored in’ and of course its temporary, unlike a real tattoo. I hope that this is helpful!